Home »Announcements»Event Recommendations! Top Tips from the Team! 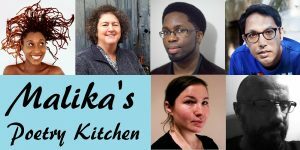 Malika’s Poetry Kitchen cooks up a feast of poetry on Saturday 8 July. Featuring a delectable array of contemporary and spoken word poets including two Kitchen Founders Malika Booker and Jacob Sam La Rose, as well as Jill Abram, Rishi Dastidar, Seraphima Kennedy and Peter Raynard. There is no doubt that this will be a lively and varied evening. As the name suggests, this brilliant format brings together poets who share a publishing house, namely Peepal Tree Press. So not only do you get to hear three superb poets, but you also get a flavour of the Press that publishes them. Peepal Tree publishes the very best international writing from the Caribbean, its diasporas and the UK. It is great to have an opportunity to welcome Peepal Tree to the Festival and to feature Roger Robinson, Nick Makoha (just nominated for a Forward Prize for Best First Collection for Kingdom of Gravity!) and Seni Seneviratne. Come and hear them read and chat about their work with host Jill Abram. This event pairs 12 poets and invites them to collaborate to create a new poem, which they will perform for the first time at this Festival finale! Brainchild of poet S.J. Fowler, The Enemies Project has led to over 500 poets collaborating and performing at over 200 events in 18 countries. Finally we get to enjoy this dynamic and inventive approach at Ledbury! So come along and hear Enemies: Roz Goddard, Gregory Leadbetter, Sarah James, Ruth Stacey, Myra Connell, Rhiannon Hooson, Nichola Dean, Kay Wareham Morris in a unique and joyous celebration of creativity and collaboration! ← Previous Previous post: Air Poems in the Key of Voice – rich, immersive, spine-tingling! Next → Next post: 2018 Festival Press Release!